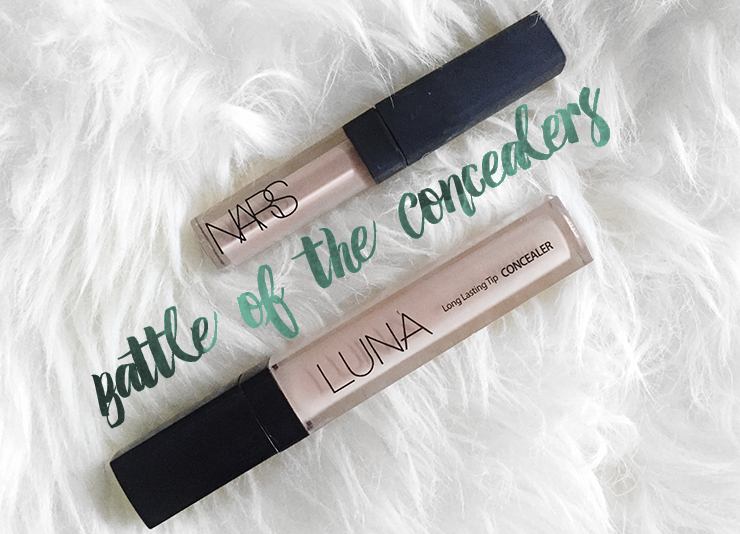 Battle Of The Concealers: Is the Luna Long Lasting Tip Concealer a DUPE for the Nars Radiant Creamy Concealer? Wow, that has to be the longest title of any blog post I've ever written. May I let you in on a little secret...? When visiting New York City, I had a looong list of undercover blogging missions. Yep. You read that right. I wasn't there to amuse myself (well, mainly, but...) but I've always been thinking about all the possibilities the big apple hold for blogging! So when I saw convenient sample sizes of Nars uber famous concealer lying around at the registers of Sephora, I just had to get one. I had this feeling from the first time I ever lay eyes on my favorite concealer from Luna: It has to be a dupe for the NARS Radiant Creamy Concealer. The design is so strikingly similar and the coverage and texture seemed so close to each other, I was very convinced. There was only one problem: I never actually used the NARS concealer in person and all my research was limited by comparing the Luna one to reviews about NARS that I've been seeing on Youtube. Yeah. Ain't no way I'm writing a comparison post without being actually able to....compare. Hence, my joy was almost endless when I found the sample sizes for 8$ as I had been thinking about getting the fullsize just to make this post. Yay for saving another 20 bucks! I left Sepora giggling like a maniac (to be fair, I always did, no matter what I bought. Sephora is my magical happy place.) So, ready to get down to serious concealer business...? I only own the sample size, but the fullsize tubes look almost identical. To be fair, so does probably 80% of the whole concealer population. However, something that almost stood out to me, is the 99% identical font that's being used on both products. The only difference really is the wider spacing on the Luna font. Both are in sturdy quadratic plastic bottles with black caps that have to be twisted and a doe foot applicator. NARS Radiant Creamy Concealer holds 0.22 oz while Luna brings a tiny bit more to the table: 0.26 oz respectively. Luna Long Lasting Tip Concealer: Water, Titanium Dioxide, CI 77891, Cyclopentasiloxane, Phenyl Trimethicone, Talc, Butylene Glycol, Dimethicone, PVP, CI 77492, PEG-10 Dimethicone, Disteardimonium Hectorite, Vinyl Dimethicone, Sodium Chloride, Aluminium Hydroxide, Triethoxycaprylylsilane, CI 77491, Stearic Acid, CI 77499, Chlorphenesin, Methylparaben, Butylparaben, Tocopheryl Acetate, Parfum, Hippophae Rhamnoides Fruit Extract, Centella Asiatica Extract, Portulaca Oleracea Extract, Vitex Agnus Castus Extract, Anthemis Nobilis Flower Extract. NARS Radiant Creamy Concealer: Water, Dimethicone, Hydrogenated Polydecene, Propanediol, Butylene Glycol, PEG-9 Polydimethylsiloxyethyl Dimethicone, Glycerin, Disteardimonium Hectorite, PEG-10 Dimethicone, Polymethyl Methacrylate, BIS-Butyldimethicone Polyglyceryl-3, Sorbitan Sesquiisostearate, Dimethicone/Vinyl Dimethicone Crosspolymer, Phenoxyethanol, Isotearic Acid, Polysilicone-2, Aluminum Hydroxide, Maltodextrin, Trisodium EDTA, Lecithin, Silica, Tin Oxide, Triethoxycaprylylsilane, Tocopheryl Acetate, Sodium Metabisulfite, Magnolia Officinialis Bark Extract, Tocopherol, Vitis Vinifera, Mica, CI 77891 Titanium Dioxide, CI 77491, CI 77492, CI 77499, CI 77163, CI 42090. I initially wanted to compare the two lightest shades available, but I was only able to get a sample size of the shade "Vanilla" from NARS, which is their second lightest shade available. Sadly, the Luna concealer only comes in two different shades that probably aren't usable for anyone deeper than NC25 (for reference, my skintone is NC10-15ish). So if your skin has a deeper tone, NARS has a way bigger variety on skintones, something that is still sadly missing in Asian make-up. 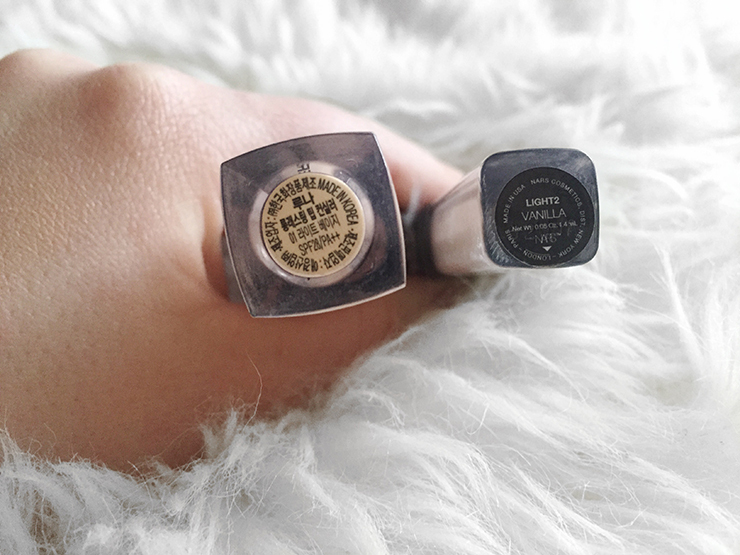 Although both shades here are about the same in terms of lightness, the Luna shade #1 Light Beige turns out quite more yellow than NARS. The texture is very similar, with NARS being a little bit more creamy, but not by much. Both are more on the creamy rather than on the liquidy side. As for the coverage, I used a lip liner to imitate blemishes and my eyebrow pen (Anastasia Beverly Hills Brow Wiz in #Granite, for anyone wondering) for general darkness. 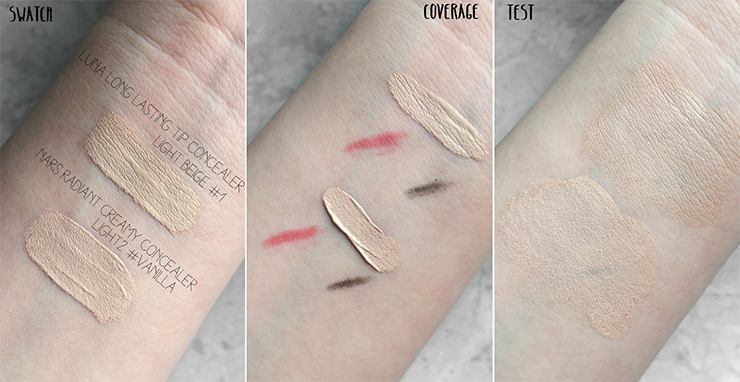 Both concealers provide insanely good coverage. Surprisingly enough, the Luna Long Lasting Tip Concealer provides almost 100% coverage, even on the dark color although it's texture is not as thick as NARS. Definitely impressive! So, what about the actual performance around the under eye area? I, unfortunately, always had dark under eye circles, no matter how much I sleep, eat or drink: They always stay the same, so a good concealer is something I absolutely cannot live without. Left side is the Luna Long Lasting Tip Concealer, right side is the Nars Radiant Creamy Concealer. And to be honest...? I absolutely cannot tell a difference. I can't. No matter how long I stare in the mirror or at pictures, for me, both products perform absolutely the same. 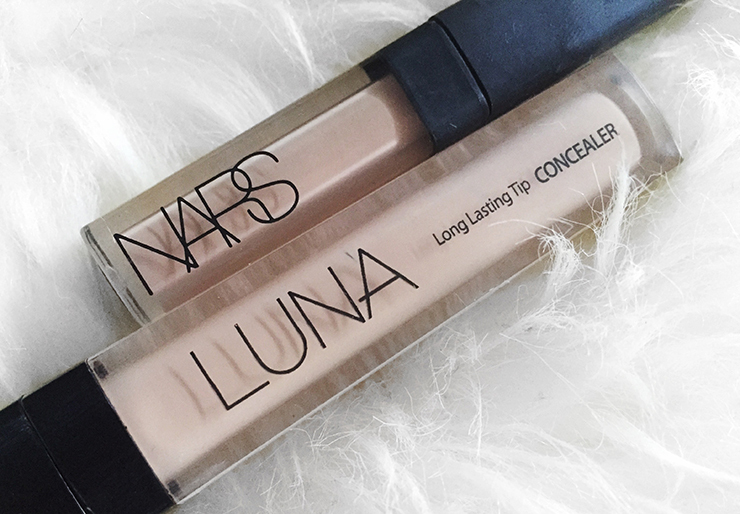 So yes, to me, the Luna Long Lasting Tip Concealer is absolutely worthy of being called a dupe for the NARS Radiant Creamy Concealer. 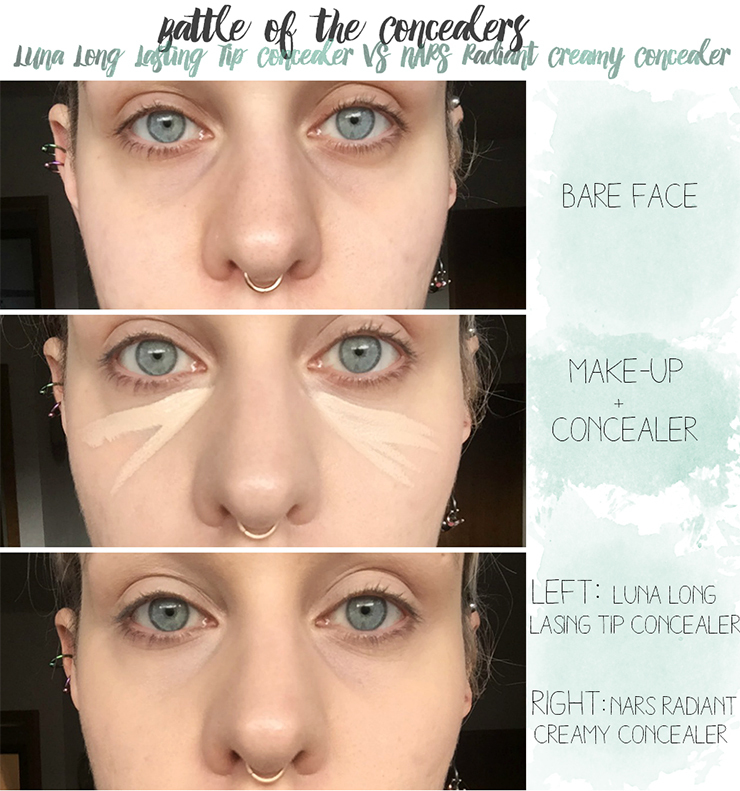 I just wish there would be more shades available so that more people could benefit from this concealer! For only half the price, you get a product that is just as good as it's famous Western cousin. I also prefer that the texture is just a little less thick than the NARS one as it makes it a lot more easy to blend for me personally. Needless to say, I've been using this concealer for one and a half years and have three back-ups. Just in case. Of apocalypse or something. What's your favorite concealer? Have you find any Asian Beauty dupes for famous Western make-up brands..? If so, please let me know! :) Hope you enjoyed this comparison post and thanks for reading!